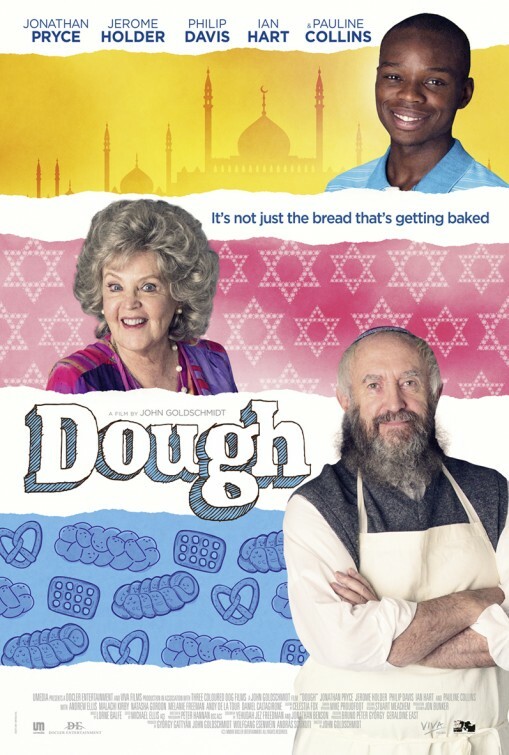 The synopsis for the comedy “Dough” seems like a racist joke – an old Jewish kosher baker struggles to keep afloat until his young Muslim apprentice drops cannabis into the dough, spending sales (and customers) sky-high. Get it, sky-high? And look at these posters – trying a little too hard with this gimmick, no? It’s actually funny, because if this were a Hollywood comedy it would be raunchy and starring Jonah Hill or Seth Rogen as the old Jewish guy. Not that director John Goldschmidt doesn’t have some comedic elements, it’s just that the heart of the story isn’t being mined for its potential drama, making this independent film a missed opportunity. 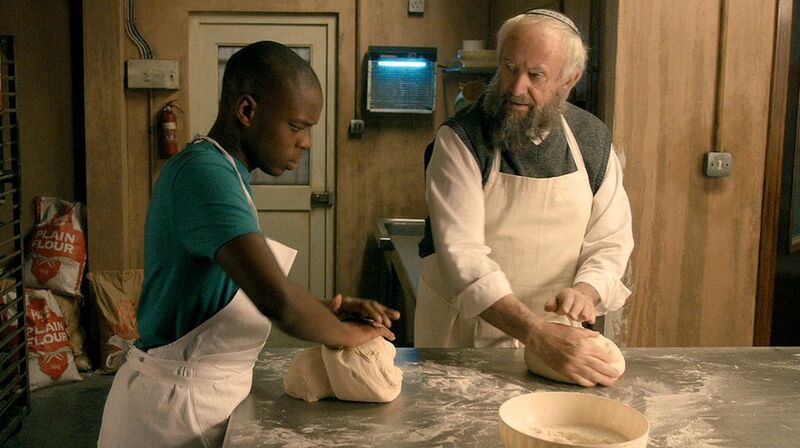 “Dough” takes place in a modern-day setting, in an old English neighborhood, where we find aforementioned elderly Jewish baker, Nat (Jonathan Pryce), who has kept his family bakery, Dayan & Son, afloat for years – despite his son, Steven (Daniel Caltagirone), opting for a career as an attorney – yet is now threatened by the big business of franchise store owner, Sam Cotton (Philip Davis), who wants to disassemble the entire block Nat’s bakery is on to build a parking garage. It doesn’t help that his assistant quits to go work for Cotton, adding insult to injury, finding the exasperated baker unexpectedly enduring interviews for an apprentice. Running parallel with Nat’s story is the story of a young Muslim man from Darfar named Ayyash (Jerome Holder), a refugee who lives with his mother in the same neighborhood as Nat. 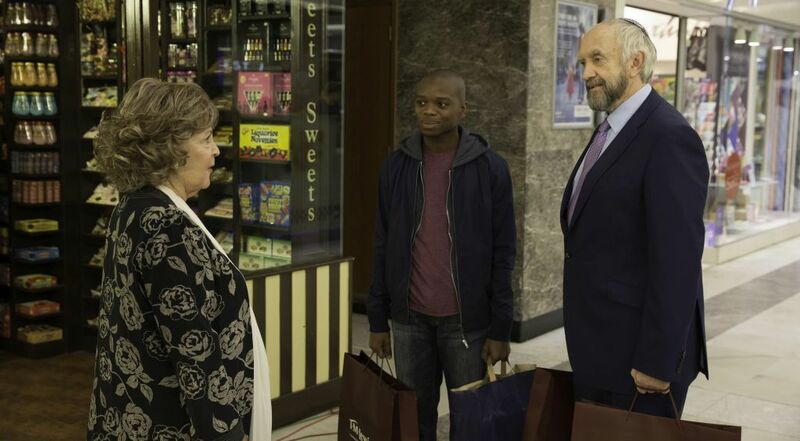 In an effort to get him and his mother out of their leaky ceiling apartment, Ayyash is determined to work for local drug dealer, Victor (Ian Hart), but he’ll need a steady job in order to avert suspicion. His mother strong arms him into taking the apprentice job at Dayan & Son and, although Ayyash is reluctant at first, he finds his groove soon enough by dropping little baggies of grass in orders for certain clients of his, er, customers. And then one day, Ayyash panics and tosses a whole bag of marijuana into the dough mix, in an effort not to get caught. To keep his accident (and side gig) from Nat, Ayyash uses the dough to make challah bread – and well, sales rocket and suddenly the special ingredient is in everything they make, resulting in lines out the door, much to Nat’s (and Cotton’s) surprise. If you’ve been around a sitcom comedy or are familiar at all with comedy tropes, you don’t have to wonder what happens in “Dough”. That’s unfortunate coming from the debut of screenwriting duo, Jonathan Benson and Jez Freedman. You’d think they’d try and offer something a little more original for their first feature-length film, but hey, it’s just great to be picked up, right? I’m not sure what made director John Goldschmidt seemingly come out of retirement for this movie – his last film was “Maschenka” with Cary Elwes, released 27 years ago – since the screenplay doesn’t seem very original apart from the fact that it pairs a black Muslim kid with an old Jew (which again, feels like a joke set-up). When you watch so many movies per week, you wind up determining whether or not they’re gonna be worth your time within the first fifteen minutes. Either way, I still have to see the movie through until its end, but this came to mind while watching “Dough” which actually started out with two very interesting characters in Nat and Ayyash. We follow their routine, Nat wakes up at 4 am to get things going at the bakery, while Ayyash is losing his pants as he crawls out the bathroom window of a nightclub in an effort not to get caught by the police who just nabbed his dealer. The juxtaposed parallels are curious, leading us to wonder where the two stories will go, even though we know what’ll get dropped in the dough. They’re just two different people from two different worlds, yet in the same neighborhood trying to make ends meet. The story derails though the more screen time given to the two character’s individual one-dimensional antagonists. The character Ian Hart plays acts like an over zealous Guy Ritchie extra, while Philip Davis might as well be twirling his mustache (if he had one) he’s so predictable. These two characters became quite grating very fast. It’s too bad, because “Dough” offers interesting characterization for Nat and Ayyash. The overall storyline may be predictable, but it gets little character details right for these stubborn men. We learn Nat is a widower and former boxer (what? ), who hangs out at home with his best friend where the two of them alternate between repetitive viewings of “Singing in the Rain” and “Butch Cassidy and the Sundance Kid”. We also learn that Ayyash’s father is probably dead, after his Darfar village was attacked, prompting he and his mother to flee, yet his mother maintains his father is alive. These are interesting details that inform who these characters are, but they happen to be stuck in a movie that is too focused on the gimmick of baked pot goods and cheap laughs, than the potential drama that is underneath it all. As expected, the acting standout is Pryce (a favorite of mine since his bit parts in “Brazil” and “Glengarry Glen Ross”, who is also currently killing it as The High Sparrow on “Game of Thrones”), who plays the somewhat cantankerous character straight, nailing all Nat’s religious and traditional traits. Some of his best scenes though are with the great Pauline Collins (the one and only “Shirley Valentine”), who plays Joanna, a peer of his who remains in the community solely due to her romantic longings toward a clueless Nat. Collins is sweet and when she is with Pryce, I found myself wanting to watch a film with just them. I guess that’s the big problem with “Dough”. The screenwriters really aren’t trusting that there’s enough going on here with their characters, so they have to throw in the weed gimmick. Unfortunately, that doesn’t happen until forty minutes in and I found myself forgetting that plot point was even going to take place. 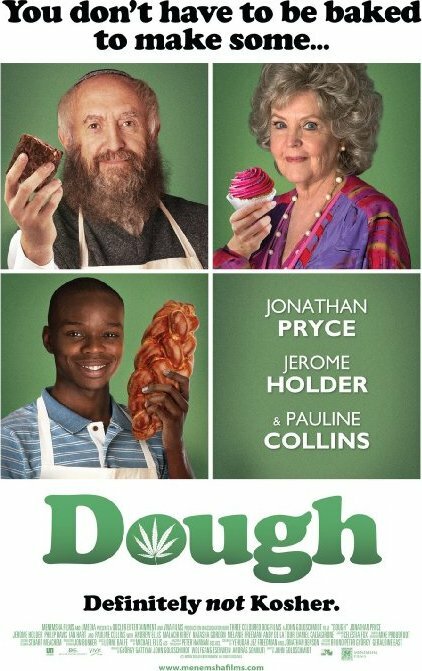 The cannabis bit didn’t really need to be dropped into “Dough”, but I doubt the film would’ve gotten a green light without it.